Snapchatters will be able to use their face to control a football-themed game featuring Three's new mascot the Puggerfly, in a new Lens sponsored by the mobile network. Three is the first brand to use Snappables, a new Lens launched by the platform in April that incorporates the user's face into an augmented reality game. They can be controlled by touch, motion and facial expressions. Puggerfly, the brand’s pug/butterfly-hybrid character, is billed as the world’s first Snapchat augmented reality pet. He was created to promote the addition of Snapchat to Three’s Go Binge, which lets consumers use the platform without eating into their data allowance. Kat Ward-Smith, director of brand and communications at Three, said: "Since the start of our partnership with Snapchat we have focused on creating innovation and true integration across our campaign, end to end." 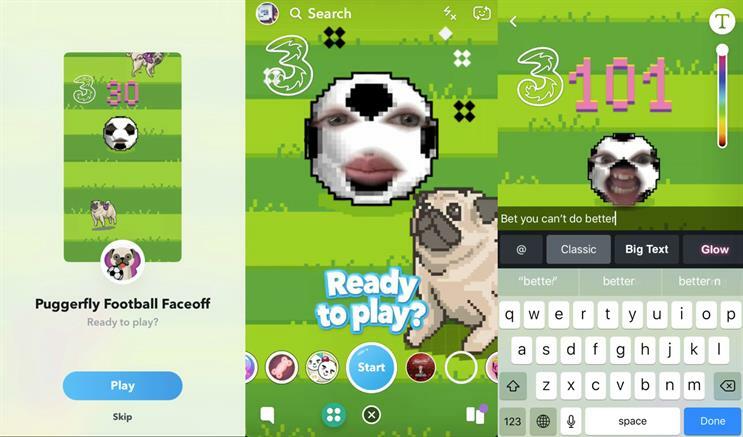 David Norris, Snapchat’s creative lead in the UK, added: "We know how important big cultural moments are on Snapchat, and it is so exciting to bring Puggerfly back to the camera during the first weekend of the World Cup."